Submitted by mas_admin on Thu, 2008-09-04 23:27. The Times today reported that the State has announced the long-awaited and substantially scaled-back expansion plans for the Jacob K. Javits Convention Center. The new scheme for the Javits Center would add 60,000 square feet of exhibit space, far less than in earlier plans. Ms. Lampen said that the development corporation was exploring the possibility of putting a convention hotel with a large ballroom and meeting room space at the north end of an expanded Javits site, between 39th and 40th Streets. There's movement on the development of the Hudson Yards. According to Community Board 4, the EIS Scope Document has been released can be found on their web site, and also on City Planning's site. The Related Company will be presenting their plans for the Western Rail Yards to Community Board 4 next Monday, September 15. On September 22, the Board will have a "Community Input Meeting" about the five design proposals for the Hudson Yards park and streetscape design. Visit their site for meeting details and other information. Newpennstation thanks Community Board 4, for correcting our information on development around Hudson yards. Read "Plan to Expand Javits Center Is Revived, Less Ambitiously" in the New York Times by Charles Bagli. Submitted by keenan on Tue, 2008-01-22 18:15. Spitzer’s proposal for a $5 billion expansion to the Javits Convention Center – his “thoroughbred” convention center – is officially dead. The new expansion plan calls for a 100,000-square-foot addition on the block between 38th and 39th streets, down from the 500,000-square-foot addition proposed earlier, and would connect to the existing building. The state is hoping to sell the block bound by 39th and 40th streets, between 11th and 12th Avenues for about $800 million to help fund other projects (like the 7 line extension). Read “New York Settle on Far More Modest Expansion of Javits Convention Center,” by Charles Bagli in The New York Times. Submitted by keenan on Fri, 2008-01-04 15:57. Yesterday, Assemblyman Richard Brodsky conducted a hearing on West Side development with civic groups, including the MAS, community boards, and business organizations. 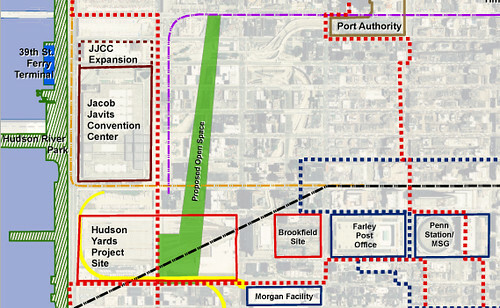 A major point of discussion was the possibility of building a new convention center over the railyards in Sunnyside, Queens now that the Javits Convention Center expansion plans have been substantially curtailed. Other topics included financing the No. 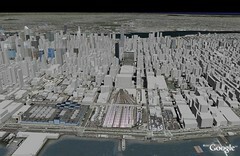 7 line extension and state ownership of the Hudson Yards site. We strongly believe that Moynihan Station will catalyze West Side development – if the State plans for the long-term, invests in infrastructure, and maintains land ownership.